Blooms News: We’re Featured on My Hotel Weddings, AllSeated, Sunset, Parade and More! From social media and Pantone’s color of the year to fashion trends and what’s hot on social media, it can be hard to stay on top of the latest wedding trends. With that said, we make it a point always to share what’s on trend with you to keep you ahead of the game. 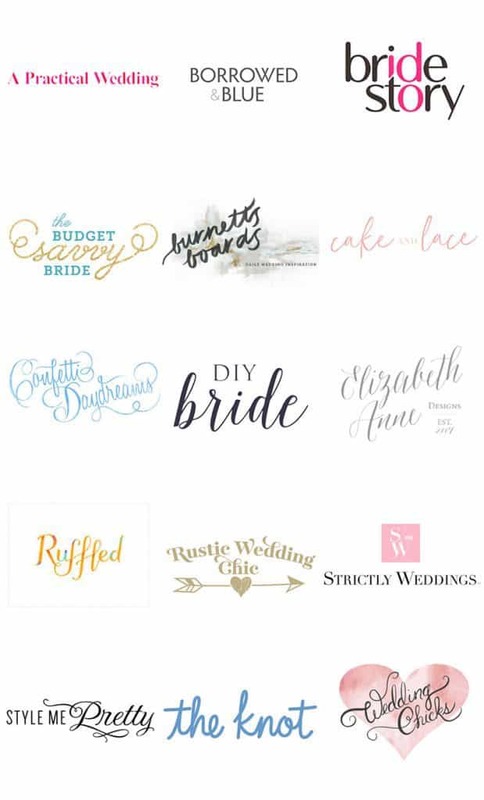 This month we’ve been sharing all of our secrets with My Hotel Wedding, AllSeated, Sunset, Parade, SHEFinds, and Bridechilla! Keep scrolling for the latest trends and tips planning your wedding day, and we hope you enjoy the articles from this month’s Blooms News! We’re beaming to share that we recently worked with our friends My Hotel Wedding to highlight 2018 Floral Trends for Hotel Weddings. When it comes to the types of flowers, you’ll see this year, get ready for dahlias and ranunculus galore! While both of these blooms are uniquely their own, one thing is for sure, the diverse color options both of these statement blooms bring are just one of the reasons they are popular for engaged couples. You can include one (or both!) of these blooms and double-up on a hotel wedding trend by choosing a moody color, such as a darker fuschia paired with a powdery pink. 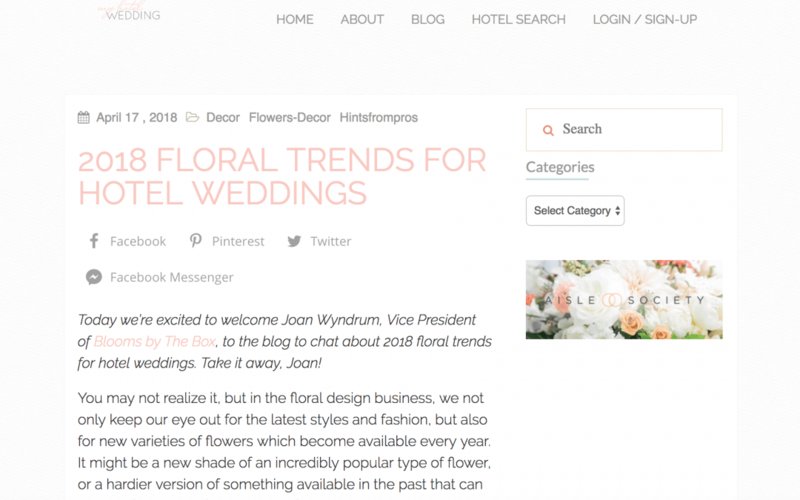 We didn’t stop here for 2018 floral hotel wedding trends, so visit the full article by clicking here to get all the details. If you were as excited about the Royal Wedding as we were, then you’re going to love our collaboration with AllSeated! 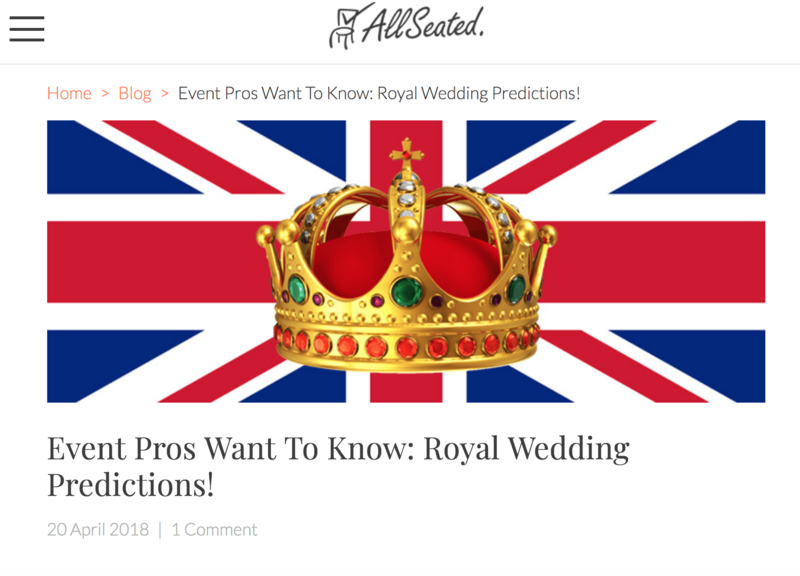 While there has been much speculation about what Meghan and Prince Harry will include, AllSeated worked with wedding pros to make the top predictions in their article, Event Pros Want to Know: Royal Wedding Predictions! The Royal couple has revealed that their wedding flowers will include white garden roses, foxgloves, and peonies. What remains a mystery is how these luscious blooms will be incorporated. Our own, Joan Wyndrum predicts that Meghan will have peonies everywhere and lots of them! And, since we can all assume their wedding will be modern, bright, bold peonies might be a part of the arrangements too. If you want to read Joan’s prediction on how Meghan may honor the late Princess Dianna, browse here to access the full article. We’ve always held a special place in our hearts for jewel-toned weddings. This beautiful, bold theme not only can add lots of flair to your decor but can leave showstopping impressions for all of your wedding guests! 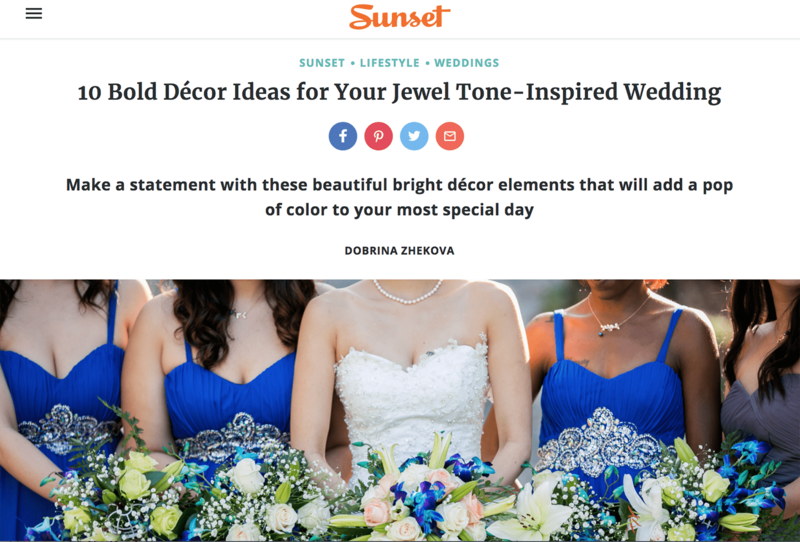 All of these reasons are why we were excited when the folks at Sunset Magazine asked for our thoughts on their article, 10 Bold Decor Ideas for Your Jewel-Toned Wedding. Our marketing guru, Danielle, recommends that couples shouldn’t be afraid to mix multiple jewel tones into a single color palette. She adds, “They look best when paired with other bold colors! Experiment with flowers and greenery in shades of ruby, sapphire, and emerald.” Danielle also says that utilizing rich, sapphire flowers into a bouquet can be perfect for your something blue. Browse here to read the full article on Sunset. It seems that vintage weddings are never going away, and we are here for it! The amount of endless, charming details that can come with a vintage theme are exactly why we believe this trend is here to stay. And, incorporating your flowers with this theme has never been easier. We teamed up with our friends at Sunset to help shed some light on the best ways to highlight your flowers while still paying homage to your vintage style. Our co-owner, Joan Wnydrum, says that Queen Anne’s lace, dusty miller, brunia, and scabiosa are the perfection blooms for a wedding celebration. These flowers can be paired with your favorite hardcover books and you can dress-up your vases with antique lace for texture and height to create the perfect vintage centerpiece! 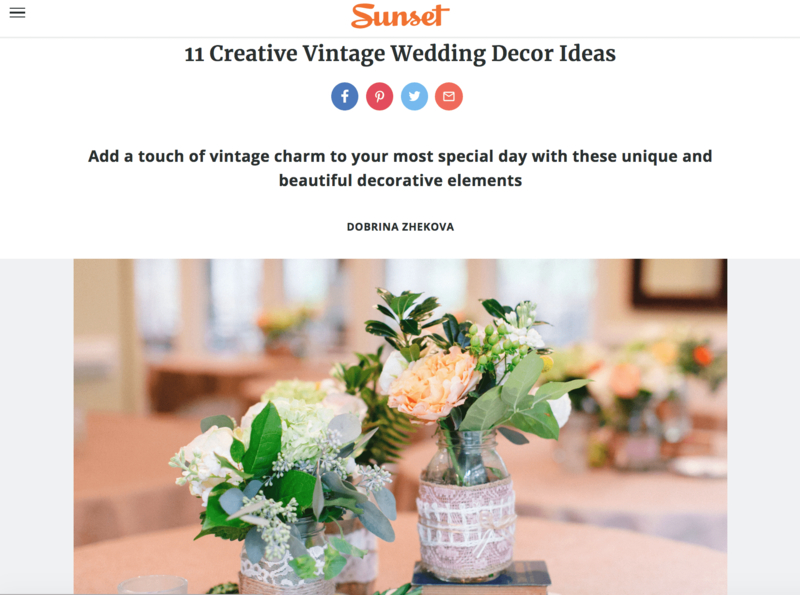 To get more creative vintage wedding decor ideas, visit Sunset’s blog by browsing here. 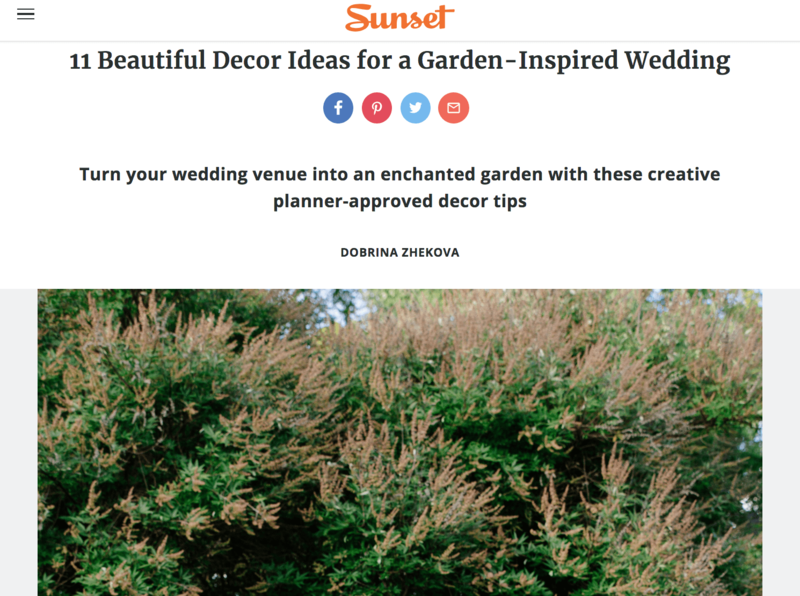 Sticking with a few of our favorite wedding themes, we spoke with the team at Sunset, and this time we focused on the beloved garden wedding theme. Of course, we had a lot to say when it comes to creating your every on enchanted garden escape through creative wedding decor, and we couldn’t wait to share our thoughts! The best way to get your guests “in” on the garden theme? We suggest creating an impactful first impression the moment your guests arrive at the reception, which can be as easy as incorporating moss with the place cards! With watercolor still making a splash in 2018, hand painted inspired invitations, and wedding signage are another way to kick-off the festivities in garden fashion. If you’d like to get all 11 Beautiful Decor Ideas for a Garden-Inspired Wedding, click here. Did you know that May brings a lot of great deals and steals when it comes to making purchases? With the kick-off of Summer and some national celebrations, there are endless opportunities to buy. 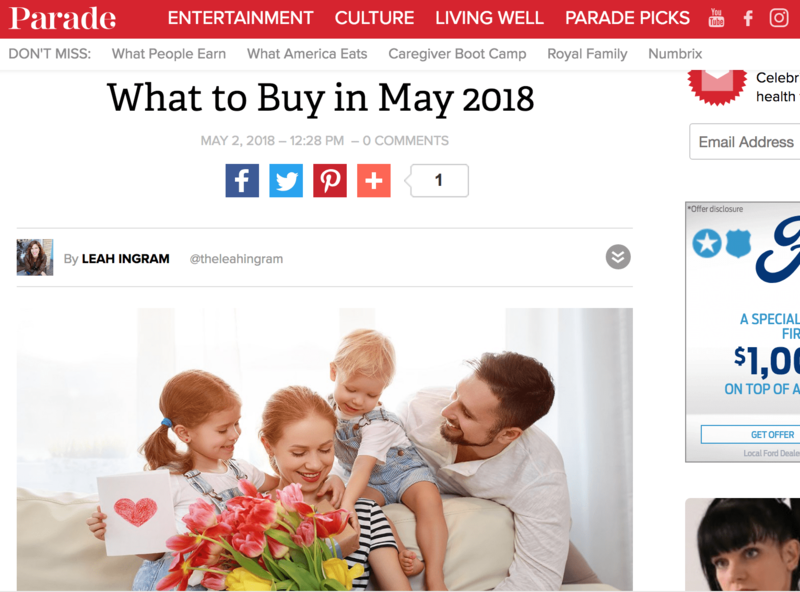 Parade recently published an article that highlights five different categories that are the best to buy during May – if not the best deals of the year! It’s no surprise that Mother’s Day and Valentine’s Day are the two holidays where flowers are the most expensive. To keep more money in your bank account, our very own, Larry Fox, suggests waiting a week or two after these holidays to send your beloved flowers. You will be able to save, and your Mom or significant other will feel like the luckiest person on Earth! To read more about our suggests for floral gifts and all five deal categories, browse here. We are in love with all of the trends for this year, but that doesn’t necessarily mean they’ll stay around for the 2019 wedding season. With many couples getting engaged this Spring and Summer, we wanted to share which trends are on the way out after 2018. 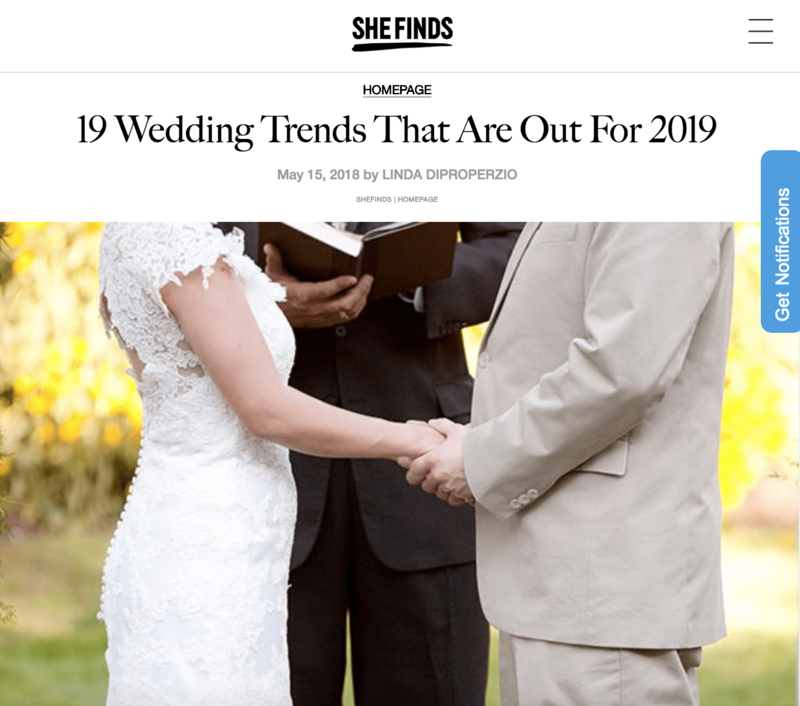 Along with a few other wedding professionals, we worked with SHEFinds to uncover 19 Wedding Trends That Are Out For 2019. Say goodbye to rustic spaces, baby’s breath, and burlap, and say hello to refined, elegance. Our own Danielle predicts that couples will shift focus to raw areas filled with metallics and hard linens. This industrial look can be paired with lush greenery and soft florals for a balanced ambiance. Access all of the 19 wedding trends that are on the way out by browsing here. The Royal Wedding might be over, but we cannot get enough of the historical event! 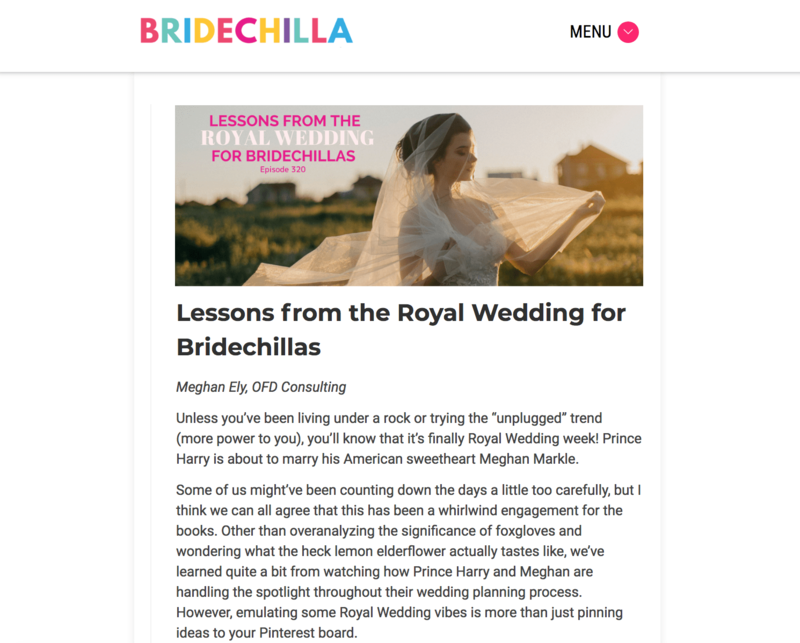 We’re reminiscing over our recent feature on Bridechilla discussing some lessons we’ve learned as Harry and Meghan plan for the big day. Our own Joan Wyndrum gave her experience on handling wedding input and filtering many unwarranted opinions from family and friends. While they may mean well, your friends and family offer plenty of suggestions throughout your planning process. It’s key during this time to remember that this is your big day and you should be confident in your choices! Try to avoid taking family criticisms to heart, because it will only add to your wedding day stress. Read more from Joan’s tips and other expert industry professionals by clicking here.